Barefoot® ergonomic flooring can provide custom-sized blocks to fit any floor plan with minimum effort or cutting. It can be purchased in sizes varying from 2 x 3 feet all the way up to 60 feet long by 12 feet wide. Any section can be connected with other sections to build larger areas or complete rooms. 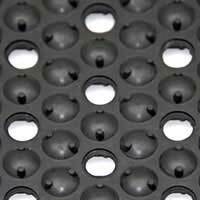 Connecting Mats: Simply align the Barefoot® mats, with the cavity of one over the interlocking strip of the other. Make sure the corners are touching. Then gently tap the units together, starting at one corner. The interlocking system is self-aligning. It is easy to make two mats zip-lock together. 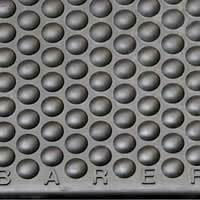 Finishing the Edge: Barefoot® is designed to leave a finished edge in every application. The interlocking strip can be removed to leave bevels around the outside of your flooring area. A few light passes with a utility knife cuts through the high-quality rubber and permanently removes the interlocking strip, so be sure not to remove it until you are certain you don't need it. Conductive/ESD: Specially compounded EPDM rubber for the electronics industry. Each module is certified to be from 1x104 to 1x106 ohms surface to ground resistance. Scientifically shown to be the BEST ergonomic flooring made. Recipient of more Patents, Awards and Honors that any other industrial ergonomic flooring. "Thanks for the BEST ergonomic mat I have ever set foot on." "Operators love it and don't feel fatigued after a ten hour shift. Complaints about lower leg and foot pain have dramatically reduced with this mat." Tony Hayes, Ergonomics Facilitator, Ford Motor Co.
"Barefoot is a significant improvement over the prior floor mats used within the facility. The ergonomics are noticeably superior." "I just wanted to take this time to thank you for Barefoot. We have tested many different types of mats, but found yours to be the best in comfort, durability and ease of use. It makes a big difference." Judy Lunz, Safety staff, Honda of America Manufacturing, Inc.
"In twenty-five years no mat has received the immediate approval that Disney World® gave Barefoot. Barefoot is the best mat we have ever sold, and I'd be happy to discuss it with anyone who called." Awards and Honors 1995 U.S. Patent No. 5,456,566. 1996 Silver Winner, Industrial Design Excellence Awards, Industrial Designers Association of America, Cosponsored by Business Week magazine. 1998 by the U.S. Patent and Trademark Office and the Intellectual Property Owner's Association (IPO). 1997 U.S. Patent No. 5,630,304. 8-Year Warranty: Barefoot will retain its exceptional ergonomic performance for 8 years. Oil and Chemical Resistance / Nitrile compound: In areas that are exposed to grease and oil, use Nitrile rubber. 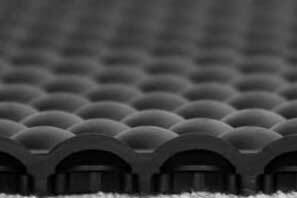 Nitrile rubber (acrylonitrile butadiene rubber) has resistance to aliphatic and aromatic hydrocarbons, acid and alkali. Examples include motor oil, hydraulic oil and petroleum greases and paint thinner. Nitrile rubber performs poorly when exposed to oxygenated solvents and chlorinated hydrocarbons. Examples include MEK (methyl ethyl ketone) methylene chloride, xylene and bleach. Please inquire about specific applications. Mats in oily areas must be properly maintained. Warranty is pro-rated from time of purchase. Warranty does not cover misuse of product such as heavy fork-lift traffic, spiked shoes or lack of maintenance.